The College and Hanover community set significant goals to transition towards renewable energy sources this past year. V.S. Subrahmanian will begin his position as the inaugural Distinguished Professor in Cybersecurity, Technology and Society at the College on August 1, joining the Cybersecurity Academic Cluster. Sociology professor Janice McCabe will begin her new role as the Allen House professor on July 1, following engineering professor Jane Hill’s dismissal from the position in April. As Allen House professor, McCabe said she hopes to help students branch out while making sure they are comfortable, in addition to fostering stability and continuity. McCabe added she is eager to begin her role, as well as to integrate both the academic and social aspects of student life. Professor of microbiology and immunology at the Geisel School of Medicine Ambrose Cheung was recently granted a 2017 Harrington Scholar-Innovator Award from the Harrington Discovery Institute in Cleveland, Ohio. The inaugural class of The Dartmouth Institute for Health Policy and Clinical Practice’s two-year online master of public health program will make its second visit to campus over winterim. 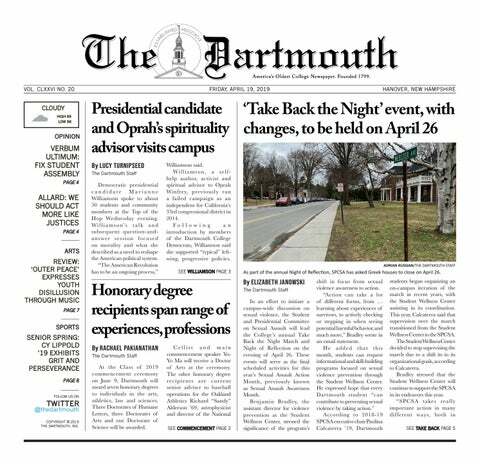 The new program offers the first online Dartmouth degree. The Physicians for Human Rights National Student Conference is being held at the College this weekend. This year’s conference will center around the theme “Violence against Difference,” emphasizing how perceptions of difference affect human rights ethics and outcomes. One year ago, Dean of the Tuck School of Business Matthew Slaughter, along with several members of the leadership team, set out to refine the graduate school’s mission. This past Tuesday, U.S. News and World Report announced that the College rose from 12th to 11th place in the 2017 college rankings. Throughout her freshman year at Dartmouth, Rachel Patel ’17 was interested in becoming involved with scientific research.